Trees need a lot of care. Had I known then what I know now about fruit trees, I would never have been so negligent in the care that I gave them, and I would have put a lot more research and planning into where I was planting the trees and what kind of trees grow best in the Willamette Valley. When you learn by trial and error, you just waste a lot of time, money and effort. An ounce of prevention is worth a pound of cure. And in this day and age with the internet there is no lack of information about how to do it right in your garden. Or at least how to do it better. In the last few years I’ve lost two arborvitae and three fruit trees to disease or other factors. I will surely lose more if I don’t commit to a better care program, and that is what I am currently focused on. 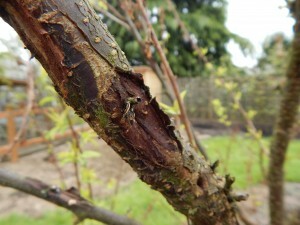 The most recent disaster that I have had to deal with is the canker problem that devastated my Toka plum tree. 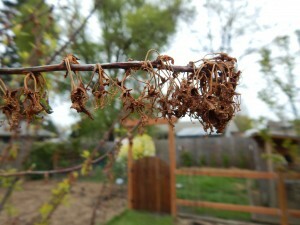 The photos provide a very ugly and clear example of what canker on a plum tree can look like. In this case, it probably doesn’t get much worse than this, and the tree was so diseased with these cankers everywhere, that it didn’t bear any fruit last year, and once again after blossoming this year everything just dried up and only a few new limbs were able to produce a glimmer of hopeful green shoots. I believe this is referred to as “blossom blast” which is described well in the first link below. 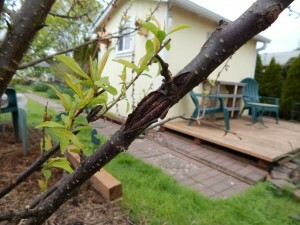 Once the canker spreads to the degree it did with the Toka plum, there was nothing I could do to save it. I could have possibly cut it back to almost nothing, sprayed intensively, cut out some of the remaining canker and then hoped for the best, but why bother? It would have mutilated the tree and made it look awful. Since it was only three years old, I figured it was best and safest to cut it down to prevent any spreading of the disease to my other fruit trees. Hopefully it’s not too late. I have another canker problem on all my cherry trees, but I may have time to save them if I put in the effort to cut out the canker, dress the wounds, and spray and prune appropriately in the future. One dormant spray each year is just not enough. There are different strains of fungi that cause different kinds of bacterial cankers, and from what I understand the disease changes names depending on the spores and the stage of the disease. Below are some good links that explain it all very well. I will attempt to cut out and dress the wounds on the cherry tree canker this summer. I think it’s too late for my big cherry tree, even though it doesn’t seem to be that bothered by its canker, but I will try to do some work on my three younger cherry trees. I may also experiment with a blow torch to cauterize the wounds. If I do, then I will take photos and try to get a post up. Wish me luck!